As one association planner said, "If I can book Monterey, attendance will go up." With so many iconic attractions and diverse activity options your delegates will be sure not to miss an event here. 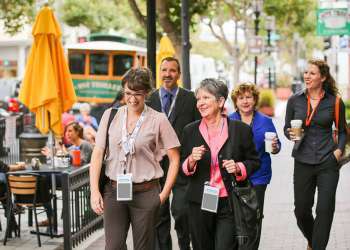 Attendees often add time prior or after the program schedule to fully enjoy the area. The freshest menu ingredients are locally sourced and available for your meals in Monterey County. As the "Salad Bowl of the World" you can count on this area to provide a cornucopia of delicious produce from the valleys and sustainable seafood from the Monterey Bay, also known as the "Serengeti of the Sea." From the Monterey Bay National Marine Sanctuary with 99 miles of pristine beaches and the truly iconic Big Sur coastline, further inland to the geological wonder at Pinnacles National Park - We take personal responsibility to protect these inspirational assets. This extends to how we welcome our guests and how we host meetings and conferences in our destination.